I have now been in Dubai for over a week and have kept almost completely out of touch with my family and friends back home. There's a 10 hour time difference, and I've just been really busy. But this is a new kind of busy--I"m not filling my weeks with 18 hours of class and 40 hours of work, but I'm actually living what I have always considered the best college lifestyle, filling my new found plethora of free time with exploring, socializing, and, alhamdulillah (thank God), studying. I haven't had this much available time to do my homework and meet people since Middle School, and it's so refreshing. I should note that I'm currently writing this on the beach beside Jumeirah Beach Residence, here as just JBR, listening to those centering beach sounds and doing some mad people-watching. To my left I see some sort of industrial port in the distance, to my right I see the Burj al Arab, behind me are skyscrapers, and in front is just sea and rocks and yachts. I've gotten no small amount of odd looks from passers-by at the blazing (yes, blazing) white chick scrawling inter a leather portfolio on Al Faisal University note paper (not that I really think people care about my note paper). JBR is close to Skydive Dubai, so every 15 minutes you can watch the people falling slowly to the ground sometimes little spin tricks, and then really pick up speed before turning and sailing into the water. I see nearly naked, reddening women sprawled on towels and women in black abayas and hijabs walking by, chatting quietly with their husbands. The men are even more diverse, sporting Speedos or 3-piece-suits, in groups with women, in packs with other men--probably leering at women, or walking in pairs, clutching pinkies, a very non-homosexual way to walk with male friends here in the Gulf. Oh yeah, and there are camels. Anyway, you probably aren't reading this to hear about the beach, so how about the AUD campus? To begin, the dormitories. 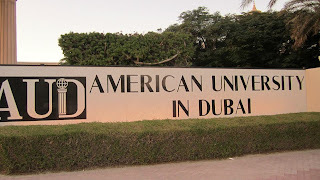 My dorm stands out as an oasis of mediocre in an otherwise incredibly satisfying life here--not to the point where I'd call this complaining, but if you're thinking of forking out thousands of dollars or dirhams for an AUD education, it should be said. My dorm is larger than my room at Troy. I'm in the "old dorms" which are blessed with high ceilings and huge windows, but the floor and furniture are dingy. My room is unique in that it has some of the ugliest border I've ever seen bisecting the tall walls. I have a switch in the hallway for my hot water heater that takes at least 2 hours to finish heating, which upon my arrival in Dubai at 1:00 AM after 28 hours of travel and the flu (or something) I met with great dismay and a minor hissy fit. The bathroom has little counter space and the small floor space is taken up by a large bidet that I know is one morning going to catch one of earrings or makeup brushes as I get ready for school. The shower has regular floor tiles on the ground and walls, so the grout is black and generally yucky. The bathroom also holds a smell I can't seem to place or eradicate, likely just built up moisture in walls and fixtures not meant for a bathroom. The dormitories have kitchens, a group lounge, and a study room that I can't complain about. Laundry is also cheap, and I have access to a girls-only gym that is lacking in cardio equipment but has good weight machines, which are the only things I don't want to use in front of boys anyway. The boys and girls dorms are separated by a high wall and two security guards. There is a 12:00 AM curfew in place for all students under 24 unless you have a parent sign a form to either opt out or change the curfew. The guards are pretty cool, and I do think they care about our well being, especially the girls, but they'll still report a curfew violation with a quickness. The campus is beautiful. There is an army of gardeners and custodians constantly keeping up appearances. There are many places, both outside and in to sit and chat or enjoy a coffee and study. The hallways and study rooms have bean-bag chairs. Troy University, take note. I'm not used to having good places to eat on campus, and I have a few options for a good cup of coffee, which I think is a necessary quality in campus life. I and my books and laptop have become permanent fixtures outside the Starbucks, surrounded by foliage and obnoxious birds. My favorite view on campus is of the soccer field: a patch of pristine green surrounded by skyscrapers and the pale pink buildings of AUD. We have a convenience store, dry-cleaning, a barber shop, and a beauty salon on campus. Prices are fair by Dubai standards. Food prices are a bit higher on campus. In the surrounding areas, there are many food options. We are really close to Media and Internet Cities, which have nice shisha places, restaurants, food courts, and large outdoor sitting areas. The park in the center of Media City is gorgeous, and I foresee it being a good place to relax off of campus. 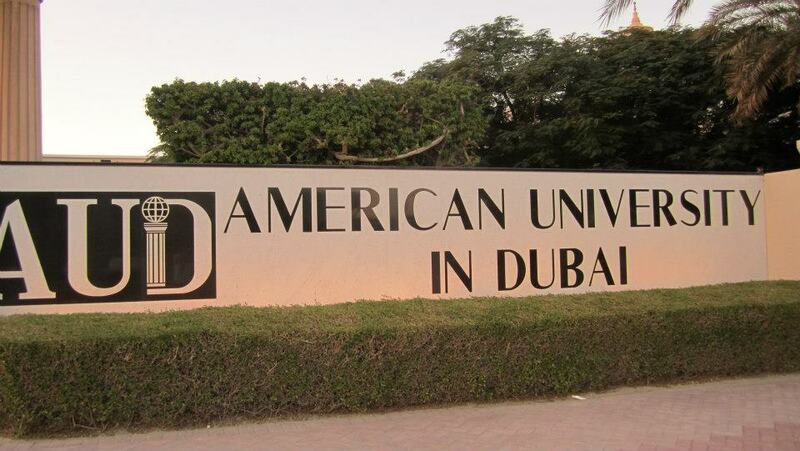 EVERYTHING delivers in the Middle East, including the on-campus restaurants. I live like 100 yards from the student center, but my roommate still likes to order delivery. Delivery is a good option though, because I'm finding that, both in KSA and UAE, the word "fast" is rarely applied to food preparation. Regarding fast food, we have a lot of American fast food chains in Dubai, including KFC, McDonald's Burger King, Subway, and Hardees. The food from these places is better here than in America, and better in KSA than here. Arabs take their food seriously, even if its just a burger and fries. 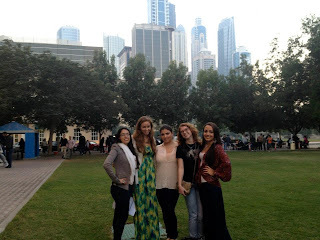 AUD is near to a metro station and taxi rides are the best deal you'll find in Dubai. I am, overall, incredibly happy with the campus. It's starting to get pretty breezy here at JBR, so I think it's time to hail a cab and head back to campus for a shower and some clubbing later. Tomorrow, it's Arabic homework, meeting with friends...and some clubbing later. I need to ask you some questions about studying in AUD as i can't find much information on the internet, I would be pleased if you give me your e-mail.